Five years ago the posted were plentiful and laser-focused on M.U.S.C.L.E. figures. I am embarrassed to admit I am shocked that the posts are so M.U.S.C.L.E.-focused. 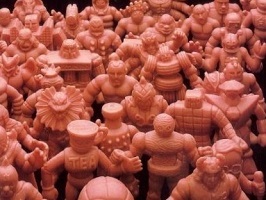 I know this is a M.U.S.C.L.E. website, but these posts are very figure focused. If you thought that, than we wouldn’t be friends. It’s still figure-centric. Just like the #209 and warp update. AW #139 was intriguing to me as I looked back at it. Focused figure-type auctions always yield interesting results. These were higher than I remembered or would expect today. The first auction had a per-figure price of $2.73. The second auction had a per-figure price of $3.15. The per-figure price that made me the most nervous in AW #139 was the error figure. It sold for $9.95 with one bid. I had some concerns that it was tortured and not an error. Thankfully Mark bought it and we learned it was an error. Finally, there was the Epilogue. When I re-read those opening paragraphs I get mad again. I feel like that was the year the Designer Toy Awards started ignoring smaller brands. You could probably cite some examples of smaller brands getting a nod, but they are the exception. I’ll go a step further. I think smaller artists set the trends. They get there first with new ideas. Then bigger guys do the same thing, send it to China, and use Kickstarter to fund their business. Am I wrong? Maybe I am. But my guts say I am correct. This entry was posted on Saturday, August 4th, 2018 and is filed under UofM News. You can follow any responses to this entry through RSS 2.0. You can skip to the end and leave a response. Pinging is currently not allowed.